San Diego’s Zzymzzy Quartet combines gypsy stylings with the great American songbook to make swing music that’s slinky and danceable. 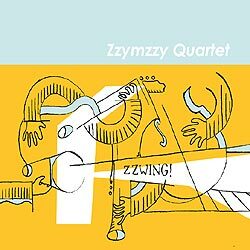 On their debut album Zzwing!, the combo enlists some of San Diego’s best musicians to play classics like “If I Had You”, exotic numbers like “Gnossienne”, and originals like the “Baby Django Creep”. For upcoming shows or to book the band, click here. Categories: album, Zzwing! (2008) | Permalink.